In 2012, I was on a SAP implementation project for one of the India’s largest cement producer. Its core team members were very smart and passionate about SAP. There was one Finance Core team member who was taking care of GL master including various other part of FICO. This user asked me about GL write-up, which he meant a document explaining the meaning/usage of each field of the GL account. I had prepared it there; the same document I have changed in regard to S/4 HANA changes in GL Account. This blog will help you understand GL Account field wise usage and changes in S/4 HANA in regard to GL Account. G/L account master records is an account’s function. G/L account master records control posting of accounting transactions. General Ledger Accounts (GL) in SAP are divided into two parts a. Chart of Account Section and b. Company Codes Section. GL is created initially for Chart of Account section and further extension is done to different company codes on need basis. In S/4 HANA there many changes in GL master compare to ECC environment. Now General Ledger and Cost Element got merged. Transaction code such as KA01, KA02, Ka03, KA06 have been removed. If you try to use them, you will be redirected to FS00. SAP tables are still updated as earlier like for GL SKA1 and SKB1 etc. and for cost element CSKA & CSKB etc. N- Non-operating Expenses or Income à Profit & Loss account used only in FI (Without CO). 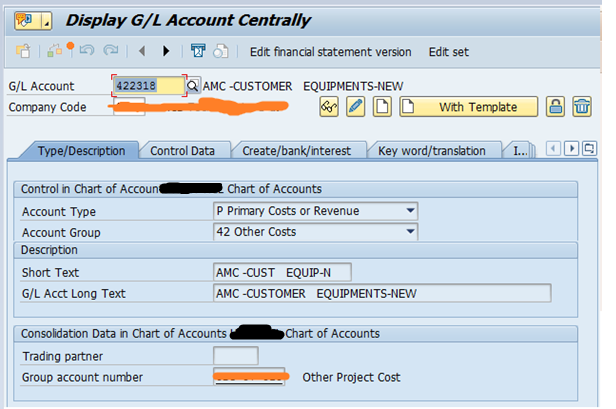 Cost Center default account assignment is not available at GL Account level. Default CO objects can be maintained in Transaction code OKB9 which is very stable & old functionality. Statistical Cost Element. Balance sheet GLs are also created as statistical cost element with category ‘90’. In S/4 HANA a check box is only appeared if any balance-sheet GLs are related to Material (OBYC-BSX) Account or Assets Account GL (AO90). This field is required for Fund management, internal order, WBS, and Investment order budgeting. 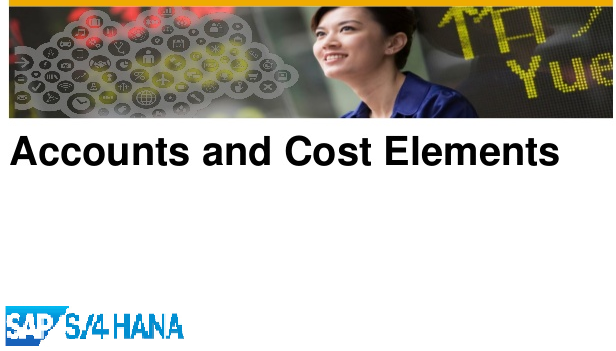 Special attention to be given while creating FSV because in S/4 HANA GL and CE got merged and everything can be seen in finance report including secondary cost element (which is also a GL in S/4 HANA) data. Business never prefer to see cost element and secondary cost element data related to CO allocation, assessment, distribution data which is generally considered to be specific to controlling. Now all these data can be seen in FI reports, Trial Balance & Balance Sheet. You need to understand business constraint and needs; and modify the FSV accordingly. You can remove those allocations (CO specific data) from FSVs. As mentioned above CO specific data can be seen in FI reports. As per requirement such data can be removed from reporting through report variant. Note: When it is said that “such data can be removed” that does not mean this data will be deleted from anywhere, it will be stopped from seeing in the particular report. G/L account master records is account’s function. The G/L account master records control the posting of accounting transactions. Let’s get field wise understanding of GL Accounts in S/4 HANA. The Chart of Accounts section contains the data that is valid for all company codes. G/L Account Number Each account is given an identification number. This numbering could be numeric or alpha numeric. GL account numbering shall be decided very carefully as it is going to be there as long as your SAP system will be there. Generally GL account are kept with numeric numbering in following manner. N- Non-operating Expenses or Income –> Profit & Loss account used only in FI (Without CO). Account Group Account group controls which fields are available for use on the GL master creation screen. It also controls number range for GL. Account Groups are generally created based on high level presentation of Financial Statement as per the accounting standard. Text Fields In this field you give appropriate name to the GL. Short text (20 Characters) and long text (50 Characters). Trading Partner The trading partner is auto flowed during postings if it is maintained in GL accounts. The Company Code section contains the data that is valid for a specific company code. Company code section is extended to company code on need basis. Account Currency Account Currency. If the currency is the same as the company code’s local currency, then any document currency can be used when posting to the account. If not, then document currency must match that of the GL account currency. Different GL currency from company code currency is used where you want keep certain GLs like Bank accounts or investment GLs in specific currency and further you want all the posting to such GLs in only one currency only. If this field is flagged, any document currency can be used with this account. Set the indicator in cash discount clearing accounts and GR/IR clearing accounts. It cannot be set in reconciliation accounts for customers or vendors. Setting it in all other instances is optional. Exchange Rate Difference Key This key specifies where exchange rate variances will be posted to. Posting w/o tax This setting will enable postings to the GL without a tax code even if the tax category is set in previous step. 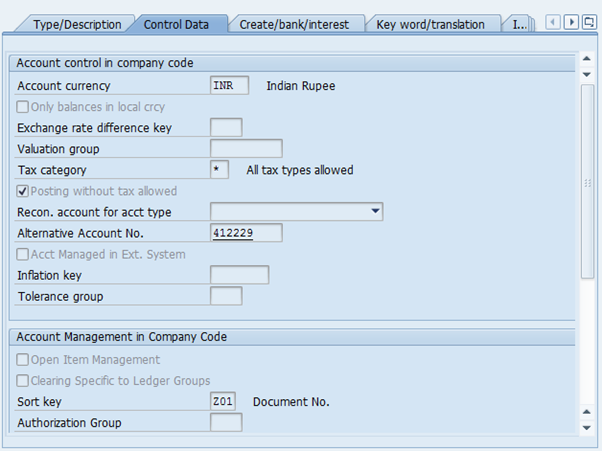 Recon account type Reconciliation accounts are used in sub ledgers such as Assets, AR, AP. Direct posting to these GLs are not possible. Transactions to these GLs comes from sub ledgers. Alternative Account Number The alternate account number is a free field and can be used as per business need. Generally it is used to map with legacy account numbers. Tolerance Group for GL Accounts Tolerance groups fields checks maximum percentage or absolute amount that can be written off during open item clearing. Open Item Managed If an account is tracked for its following process than Open Item Managed is ticked i.e. Tax Payable GL keeps accumulating postings from sales transactions and at the end of the period cumulated tax is paid to the tax authorities and posting is made in the same GL. Ultimately Tax Payable Account becomes Zero. Similarly GR/IR Clearing Account, Bank Incoming/Outgoing Accounts etc. Note: All Reconciliation accounts do show open items in the reports (FBL3H/FBL3N/FAGLL03) but we still don’t need to select this flag for reconciliation account. It is inherited that if account is created with reconciliation account type line items would be tracked through open item management. 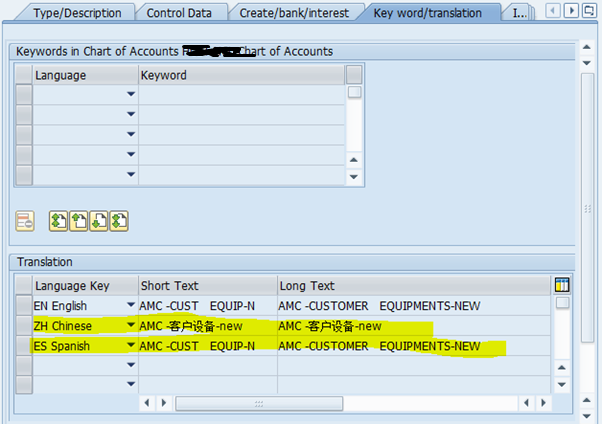 Line Item Display If you want to see line items in SAP reports for an accounts in transaction code FBL3H/FBL3N/FAGLL03. You have to select this tick. This tick is not selected in case where huge postings take place and are not actually posted for any business process or action. 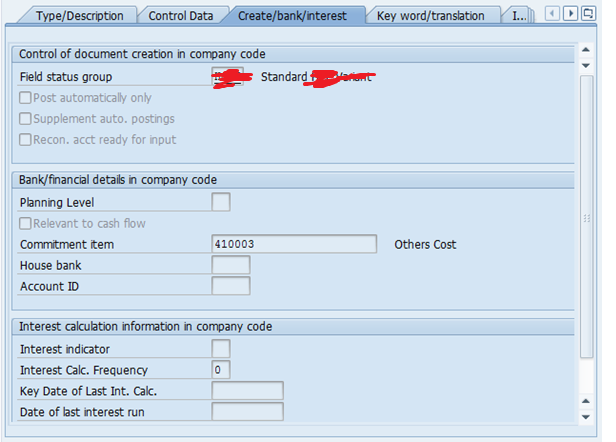 One example of this would “ZERO BALANCING ACCOUNT” which is required for document splitting. Sort key Many sort key fields are available in standard SAP and it can be further customised. It controls what value will be filled automatically during postings in ‘Assignment Field’. For example: Sort Key 10 and 14 (Purchase Order & Item) is used for GR/IR Clearing account so that auto clearing (F.13) is enabled. Authorization Group Accounts can be controlled for who can make posting to an account with authorization group. It is a free field and you can put any value and the same value need to be put in the SAP user ID who is authorised to make posting to this account. Authorization group is used for sensitive GLs. Accounting Clerk It helps identifying the responsible person for the account. Cost Element Category Cost Element Category is selected for profit & loss accounts. This is new field in S/4 HANA. Available categories are e.g. 41-Over Head Rates, 42-Assessment, 43-Internal Activity Allocation, 21-Internal Settlement. Note: Balance sheet GLs are also created as statistical cost element with 90 category. In S/4 HANA a check box is appeared if any balance sheet GLs are related to Material (OBYC-BSX) Account or Assets Account GL (AO90). This field is required for Fund management, internal order, WBS, and Investment order budgeting. The field status group controls what fields are kept as required, optional, display, and hidden during postings for an account. User happiness comes with minimum visible fields during postings. It shall be analysed carefully what fields should be available for postings. Post Automatically Only If this field is ticked, the account cannot be posted manually. Supplement Auto Postings If this field is set, a ‘post automatically only’ account can have additional characteristics such as profit center or cost center and these fields can be filled or updated manually during posting. Recn. Acct. Ready for Input It determines that the reconciliation account is ready for input when posting a document. House Bank Related house bank is updated here. It is updated in bank accounts only. House Bank Account Related house bank account is updated here. It is updated in bank accounts only. Interest Indicator If interest Indicator is given to an account; such accounts are considered for automatic interest calculation. Interest Calculation Frequency This indicator determines at which interval interest should be calculated and posted. Note: Since the same GL is used by multiple company codes which might be situated in different countries which may have different language; to tackle such scenarios you can maintain different description in different language under tab ‘Key Word/Translation’. You can use this app to search, create, display, and edit the master data of G/L accounts. You can also easily add new G/L accounts from scratch or based on existing accounts. Many more such article on S/4 HANA topic to come. Stay Connected. Learn, Share, Grow, & Succeed! Thanks for sharing! but if i’m not wrong Line item Display is mandatory in S4HANA. you won’t find this field in GL Master now. I agree with @Sandeep Devadiga, no longer line item display is mandatory because the HANA database can support all these line items. And there’s another report to run that is FAGLL03H.